Odette has already moved on from the death of her first husband and has moved in her boyfriend Brennen Glass, who is an alien! 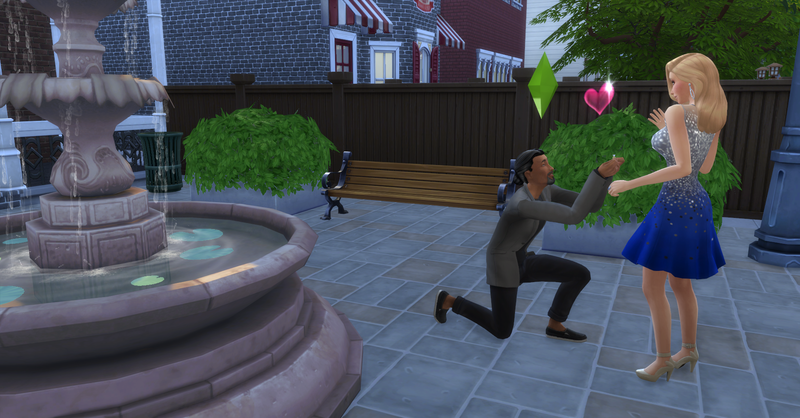 Brennen wastes no time after Odette has finished grieving to ask her on a date and propose marriage to her. Odette examines the ring before saying yes. She deems it worthy and tries it on, she likes the big shiny diamond. Odette Veuve Noire knew what she wanted from life, money and a secure future for herself. She also had to consider that she was the last of the Veuve Noire Family and that she has some obligation to carry on the family name with her offspring. She knows she will need both money and men to accomplish that, but her aspiration in life is the be a Serial Romantic so the idea of living with one person for the rest of her life really isn’t something that interests her. Fortunately she a plan to complete her aspiration, have children so the family name lives on and get rich while she does it. Odette wastes no time moving into a small house in the nice neighborhood of Pendula View, while this is not the most expensive or exclusive neighborhoods it is definitely upper crust and offers wonderful amenities with a community garden, fishing spots and a playground. She is able to collect items from the neighborhood before she is married but she will not be able to do this anymore after she get married. So on the first day she collects everything she can and sells most of it for funds since her lot was rather expensive and she needs to finish furnishing her small house. Odette plants some of the flowers she collects in order to generate an income in the future when she is not allowed to collect anymore. Then she meets this nice man walking outside her house, his name is Ulises Bromberg.